Michael has been teaching Balkan Folk Dance for over 50 years starting in 1964 with Michael Herman’s Folk Dance House in New York City. 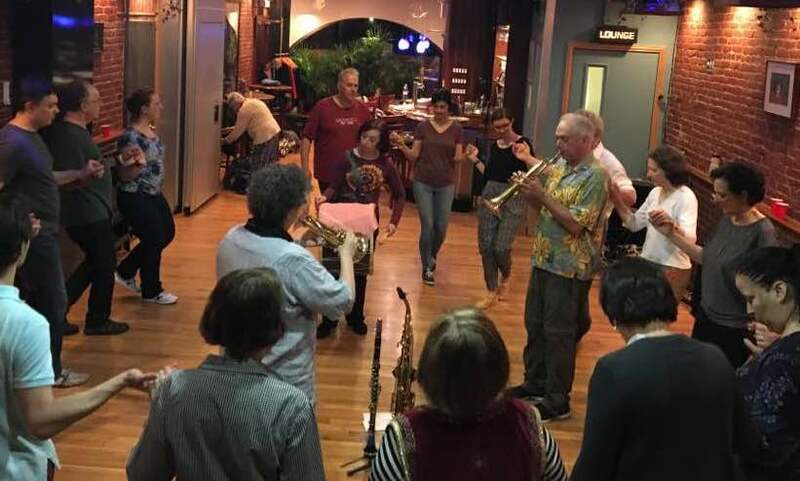 He continues to teach a weekly Balkan dance class in New York City. He has taught workshops all over the United States and Canada, as well as in Brazil, Japan, Israel, Germany, Austria, and Switzerland.Michael has been on the teaching staff of many folk dance camps and seminars including Stockton Folk Dance Camp, Kolo Festival in San Francisco, the annual Balkan Music and Dance Seminars in Mendocino, CA, and Rock Hill, NY, as well as the Macedonian Pearl Seminars in Berovo, Macedonia. Also a musician, Michael has been director and lead trumpet player of Zlatne Uste Balkan Brass Band since 1983. He accompanied ZU to brass festivals in Guča, Serbia, three times between 1987 and 1990, as well as in 2003 and 2005, where he and ZU were able to play and party with local brass bands and experience the music in its natural setting. Michael and Zlatne Uste worked with Ekrem Sajdić and Zlatni Prsti brass band in 2003, and in 2005 with Vranjski Biseri, both in Vranjska Banja, Serbia. Michael performed in the summer of 2010 with Zlatne Uste at the first competition of international bands at the Sabor Trubača in Guča, Serbia, representing the United States. For many years, Michael has been interested in Balkan music and dances, especially Macedonian and Serbian. He is an expert in the complicated rhythms of Balkan music and has made several research trips to Bulgaria and the former Yugoslavia, and studied in Macedonia with Pece Atanasovski, with whom he made research tours of the country. Michael has been on the teaching staff of the Macedonian Pearl seminar in Berovo, Macedonia.